Which Foods Contain The Most Calcium? Calcium is one of the most important mineral elements of the human body. Almost all of the calcium in the body is found in the bones and teeth. Bones are vital to protecting our internal organs; they also provide shape and structure to our body and anchor muscles. Calcium is one of the most important mineral elements of the human body. Almost all of the calcium in the body is found in the bones and teeth. Bones are vital to protecting our internal organs; they also provide shape and structure to our body and anchor muscles. The body has to receive adequate levels of calcium, especially during the developmental years of life (before age 20). This is especially crucial in women, since the bone mass tends to decline at a higher rate in elderly adult women after menopause. Calcium is also important for the proper functioning of the muscular system (for muscle contraction and expansion), the nervous system (sending and receiving nerve signals), and maintaining a proper heart. Calcium in the blood helps to prevent bleeding by aiding in blood clotting. Low blood calcium levels are regulated by the release of PTH, or parathyroid hormone. Vitamin D is a key component that helps in the mineralization of bones, ensuring healthy bone development. Vitamin D promotes the absorption of calcium in the intestines, thereby helping to maintain its concentration. 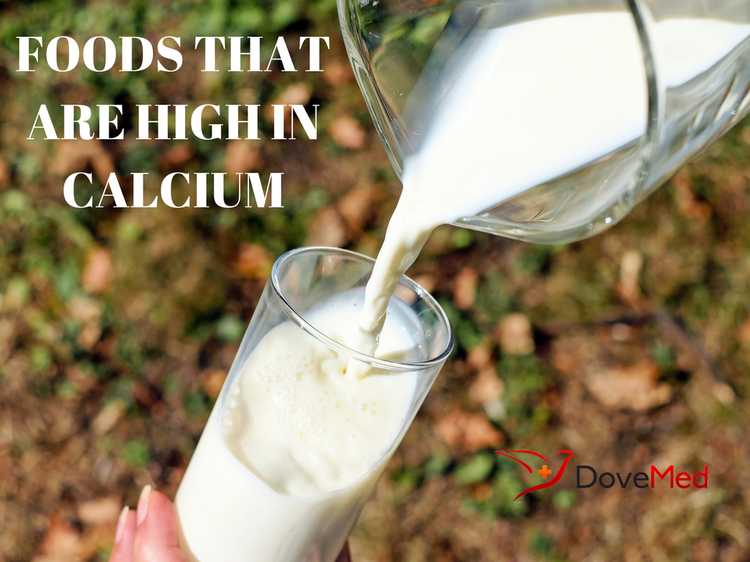 This is the reason why milk is often fortified with vitamin D.
According to the US National Academy of Sciences, Food and Nutrition Board, the recommended dietary allowance (RDA) of calcium ranges between 1000-1300 milligrams/day. Different age groups have different calcium requirement quantities. Excess calcium intake (mainly due to the use of calcium supplements/medications) over prolonged periods may cause kidney stones. An excess of calcium rich foods can also cause constipation. Calcium deficiency can result in weak and fragile bones, leading to a condition known as osteoporosis that mostly occurs in adults. Acute calcium deficiencies are often associated with other underlying conditions. It can cause tingling sensations, numbness, convulsions, and even arrhythmias (abnormal heart beats), resulting in life-threatening conditions if suitable treatment measures are not undertaken. As per the NIH, Office of Dietary Supplements, adequate body calcium levels play a key role in maintaining a healthy body. Apart from ensuring proper bone health, calcium protects us from certain cardiovascular conditions and reduces the risk of high blood pressure, osteoporosis, and even colon cancer. Proper intake and absorption of calcium may be affected by certain medications and disorders. It is always recommended to take the advice of a suitable healthcare professional before bringing about any alteration to your regular food habits, such as incorporating more foods high in calcium, or taking any multivitamin-mineral supplements. Lanou, A. J., Berkow, S. E., & Barnard, N. D. (2005). Calcium, dairy products, and bone health in children and young adults: a reevaluation of the evidence. Pediatrics, 115(3), 736-743. Greer, F. R., & Krebs, N. F. (2006). Optimizing bone health and calcium intakes of infants, children, and adolescents. Pediatrics, 117(2), 578-585. Guéguen, L., & Pointillart, A. (2000). The bioavailability of dietary calcium.Journal of the American College of Nutrition, 19(sup2), 119S-136S. Nowson, C. A., & Margerison, C. (2002). Vitamin D intake and vitamin D status of Australians. Medical journal of Australia, 177(3), 149-152.